Rayah started swimming before her first birthday, often going to the baby pool at Ken Martin Leisure Centre with her family on a Sunday – so she’s been in and out of the water from a young age. Her dad Ramnik is a Flexible Fitness member, and Rayah is following in his footsteps, having already completed an obstacle fun run with her dad as well as taking part in Race for Life with her mum too. Rayah enjoys being very active. After starting with Nottingham Swim School this year, Rayah has just completed her first Duckling badge – getting used to the water and gaining some initial experience of being in a class environment without her parents. Swim School is a great start for young children to get involved with fitness, and it helps build their confidence and self-esteem ready for other challenges later in life. At this level, emphasis is on the development of basic swimming skills and water confidence through fun and games. The Swim England Duckling awards 1–4 are used within these classes. Rayah has built the confidence to be able to jump in the pool, hold her breath, paddle and kick and show the correct form using floats. Ramnik didn’t want Rayah to be afraid of water like some of the less capable swimmers in his class when he was at school – he wanted her to feel comfortable with water from an early age. He’s keen for Rayah to have fitness and nutrition as part of her life and routine, rather than for it to become a challenge in the future. Rayah loves blowing bubbles under water and playing with floats and splashing around – it’s really built her confidence and makes her feel happy. 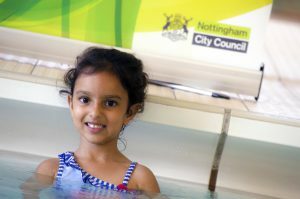 What makes Swim School so great for Rayah is that she had the same teacher for Notts Gym Tots as she now does for swimming, meaning that there’s already a respectful relationship. All the staff are friendly and helpful, and dad, Ramnik, finds the email portal updates really good and useful as it allows him to check timings and her progress at any time of the day. It’s great to see her develop her skills in the pool each week! Swimming at Ken Martin Leisure Centre is convenient and local. Rayah’s made friends and knows people in her swimming class from school – her parents have also got to know the other parents there, making the poolside a lot more sociable! 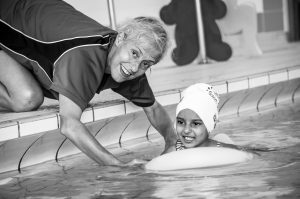 Rayah has just completed her first 10-week block and is eager to get back in the water for her next block of lessons after the school holidays. She can’t wait to start. 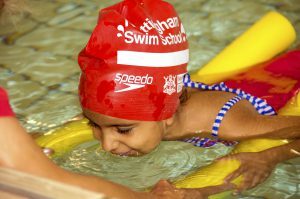 If you’d like your little one to learn to swim, visit Nottingham Swim School or call us on 0115 876 1600 to book a lesson at your nearest leisure centre.